Shown above is a fine example of a plate snow crystal photographed nearly 100 years ago by Wilson Bentley (1865-1931) at his outdoor laboratory in Jericho, Vermont. This beauty is referred to as a hexagonal (six-sided), sector-like plate crystal with extensions. It’s but one of several thousand micrographs taken by Bentley and prepared on glass lantern slides -- he pioneered the method of photographing snow crystals. 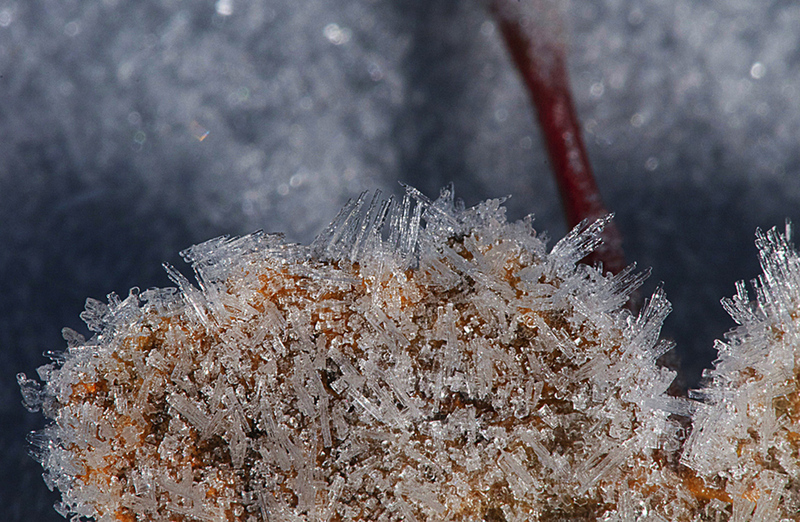 Snow crystals take shape and grow from the water vapor in cold clouds. The water molecules that compose an ice crystal are destined to form a hexagonal lattice structure. So the familiar six-sided shape of snow crystals (six-fold symmetry) is a direct result of the six-fold symmetry of the ice crystal lattice. To see more of Bentley’s impressive crystal collection visit the Schwerdtfeger Library (Bentley Collection).